Hand sewing is perhaps one of the most polarizing sewing tasks. Some people love nothing more than to settle in with a cup of tea and a good television show and patiently hand stitch, while others avoid it at all costs. Whether you love it or you hate it, everyone has experienced the frustration of making a tangled mess out of your thread. Luckily, there is a simple solution to this annoying problem. The answer is beeswax. 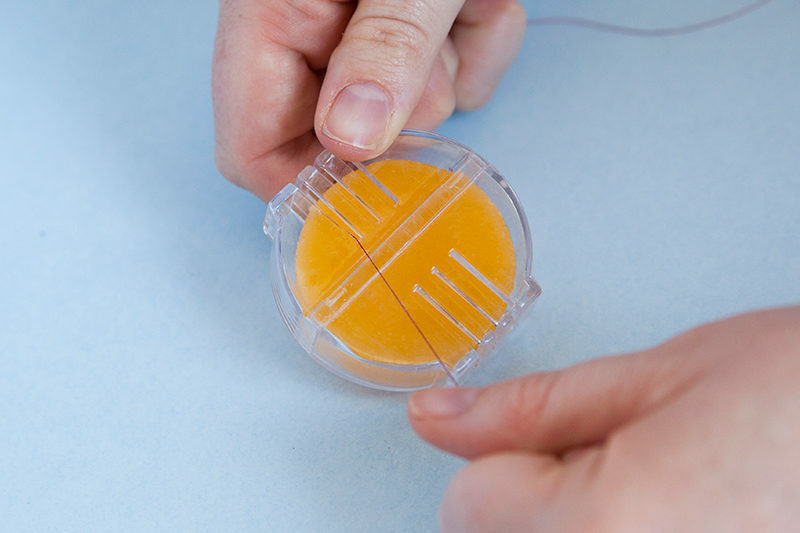 Waxing your thread before hand stitching reduces static cling, and helps to prevent tangles. You can find this product at most sewing shops in the notions section. Look for the variety encased in a plastic shell. The protective case will increase the lifespan of your wax by keeping it clean and (relatively) lint-free. Here is how you use it: cut a length of thread approximately 2 to 3 feet long, then pass the thread once or twice through the beeswax. The thread should cut into the wax slightly. Place your thread between two press cloths, and iron on medium heat. This final step sets the wax by melting it into the fibers of your thread. TIP: If you are planning on doing a lot of hand sewing, prep a few strands of thread at a time. This process creates a smooth, manageable thread that is a joy to sew with. Do you have a favorite hand sewing tip? Share below! I’ve had success with this method. I just got some silk thread for hand sewing, and I just love it. It’s my little luxury. I find the silk thread doesn’t need waxing. Good lighting is crucial to a positive hand sewing experience! In some cases, a magnifier and light together can help to marry fine stitches, thread and fabrics seamlessly. This is especially true for unpicking a seam as well. Thanks for sharing. I am one who will avoid this at all cost!!! I have used tailors wax for years but never knew to melt the wav by pressing it. How silly of me! I thought it was meant to make the thread stronger. Thanks for the tip! I’ve known for decades about using beeswax, but this is the first time I’ve heard that you should iron it. That makes total sense. Thanks for the tip! I’ve never tried wax because I worry that it will stain the fabric, but the melting it to the thread takes care of that. Now I will have to pick some up! Even with ironing it in I would still worry about it staining fabrics. I was taught when hand sewing make sure the thread isn’t too long to stop the thread knotting.I was told to measure the cotton twice your elbow length . I am with you Mo, on both counts. 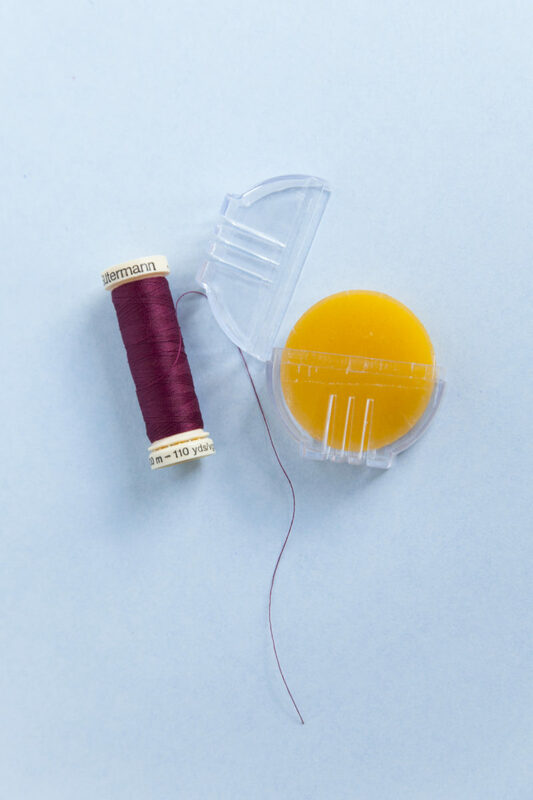 Even with ironing the wax into the thread, staining can be an issue depending on the fabric being stitched – if wax is used, be *very* sparing! My sewing teacher (50 years in the couture field) advocates for a handstitching thread no longer than the distance between one’s elbow and outstretched fingers… When too long, most threads become weakened and the surface degraded due to rubbing against the fabric each time a stitch is made. I probably still have the beeswax in a little plastic case somewhere that I bought 40-ish years ago, but had no idea how to use! Thanks!! I was also taught that you should thread the needle onto the spool, measure the thread, but then know the cut end because thread, like years and other fiber products has a “grain” and should more easily go one direction than the other. When I do this, I seldom have knots, but do wax my cotton thread. I have had a block of beeswax sitting in my sewing room for many years. I had no idea it was so useful! Thanks for the article. I don’t love to hand sew but find it vital for thread marking, basting, and detailing. I don’t have problems with tangling as long as the thread is not longer than my arm. Even though I love sitting on my couch to hand sew, I’m much faster and accurate when I do it sitting at my table. Amen to the silk thread comment. I love the beeswax suggestion, though. In my experience, beeswax makes for really great handsewn buttonholes in coats/jackets/waistcoats and the like (I appreciate they might be even more divisive than handsewing in general!). If you go to the effort of handsewing buttonholes with buttonhole twist (or some thick alternative like topstitch thread if you don’t search out the specialist thread), then waxing the thread beforehand and then waiting until finished to press the waxed thread really makes for a crisp, swanky-looking buttonhole. (I’ve got better results doing it that way rather than melting the wax into the thread before sewing for buttonholes specifically, but maybe that’s just me!) I’ve found you do have to gauge how sparingly to wax your thread using that method: as mentioned above if you use too much wax it’ll rub off and stain into the edge of the fabric. But I always do a test buttonhole on a scrap bit of offcut fabric anyway to get my eye in before I dare approach the real garment, so that helps to assess such things.